Have you never been able to talk, walk, or eat on your own? Melody Brooks always feels like that. 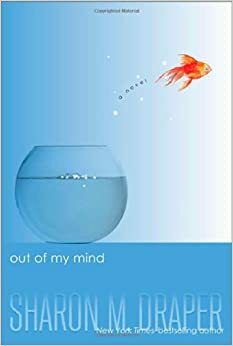 In Sharon Draper’s “Out of My Mind,” Melody Brooks, a young fifth grade girl with Cerebral Palsy, overcomes countless obstacles and outstrips her classmates in the Whiz Kids quiz competition. All her life, Melody Brooks has been stared at, called names, and had mean jokes directed toward her, all because she can’t walk, eat, play sports, or even talk on her own. Suddenly, she surprises everyone in her inclusion classes by trying out for the Whiz Kids quiz competition, a contest to see which school is the smartest, and the winner gets a tour of Washington D.C., plus three days in the city. To me, the characters of the book stuck out. Melody, the girl with Cerebral Palsy, is extremely smart and funny, but she is forced to keep her personality pent up. Molly and Claire are girls who make fun of Melody, but of course, they get what they deserve when they are mean. Rose is another girl who is Melody’s “friend” but the two have never really clicked, because Melody’s condition separates them. Another thing that the book excelled in was the plot. The plot contained introductions to the characters and had a backstory, and the idea of Melody triumphing is what made the plot great. For instance, Melody triumphs during the tryouts for Whiz Kids, and she also brings Elvira (her speaking computer) to school and impresses everyone. The style of writing also outstripped other books. The story is narrated from Melody’s point of view, and it includes what she thinks, feels, and types. The story uses a plethora of various metaphors and similes to capture the image of what Claire looks like, or how the day went. For example, “Mom with wet hair should hide in a closet” describes how her mother looks when her hair is wet. Or, “The sun is glowing like some kind of frosted jewel” tells how the sun looks that morning. In brief, this book is truly astounding. The characters are easy to understand, the plot keeps the reader interested all the way through with suspense, and the style of writing allows the reader to see what Melody sees. I would recommend this to anyone, especially readers who enjoy dramatic realistic fiction.